In the aftermath of Apple’s announcement, it’s easy to forget that there are indeed other electronic brands. Amazon is attempting to remind the public that they too have interesting gadgets to offer, as they released 6 new products. With these new devices, Amazon is showcasing what they do best: tablets. Amazon’s new tablets feature a range of renovations from the e-ink Voyage to the HDX model with a 2.5 GHz processor, to the child friendly Fire for Kids. A look at the tablet market over the past year demonstrates Amazon’s consistent prowess. Based on volume of conversation alone, Amazon beats out heavy hitters Apple and Samsung. However, Amazon has historically chatty consumers, as their products typically receive high volumes of reviews. While Amazon has consistently more reviews, their volume has fallen flat in the ‘back to school’ months. 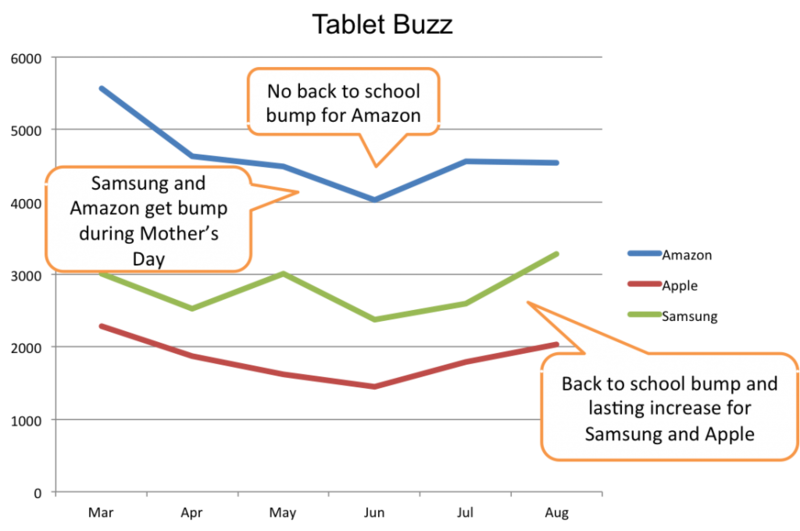 Both Samsung and Apple saw a steady increase in buzz starting in June, but Amazon’s numbers have remained static since July, a clear indication that they did not get that same ‘back to school’ bump as Apple and Samsung. Going back even further, it is clear that Apple tablets fell flat this Mother’s Day (May), while Samsung and Amazon saw an increase. Maybe kids just can’t afford to shell out the big bucks for Mom… Regardless of these ebbs and flows, Amazon’s buzz volume has been declining overall. Will these six new products boost Amazon’s buzz volume back up? Or will Apple and Samsung continue to creep into Amazon’s long held mindshare. We’ll keep an eye out here at Argus Insights. For personalized insights and consultation, don’t hesitate to contact us. Gasp! Only Samsung Affected by Apple Anticipation	Webinar Tuesday 10/7: Do New Smartphones Always Lead to New Customers?